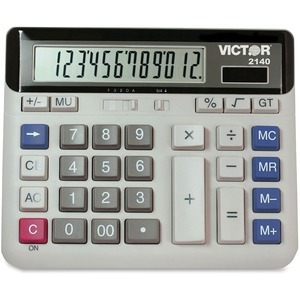 12-digit calculator is perfect for desktop use either at home or in the office. Extra-large LCD is angled for an easy-to-view display. Mark Up key calculates the selling price and profit or loss amount of an item. Selectable Decimal Switch allows you to choose how many decimal places are displayed. Selectable Rounding Switch allows you to choose between rounding up, down or automatic roundoff. With a PC Touch Keyboard, the plastic keys have similar shape and feel to a computer keyboard. Other functions include square root key, grand total key, percent key, four-key independent memory, change sign key, backspace key and automatic power down. Hybrid power operates on solar power with battery backup (L1131).